Down District Councillor Colin McGrath (SDLP) has said that NI Water’s accidental bursting of a pipe in Downpatrick’s Dunleath Park was “unfortunate” given that the contamination means football matches by children cannot take place over the holiday period. Dunleath Park in Downpatrick – the health scare continues as a sewage pipe is broken during improvement works. Commenting on the development, he said: “There have been numerous examples of these playing fields being shut down due to contamination at various points in the past few years when drains have spilled over. We have worked with NI Water to rectify this on-going problem. “Now workmen have accidentally burst a pipe during upgrade works that NI Water is completing close to the park and the ensuing contamination will take weeks to put right. 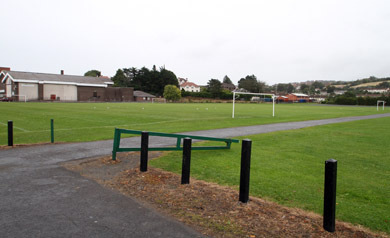 “This means that no football or sporting fixtures can take place at the main sporting playground in the whole of Down District. The fact that this has resulted from a mistake and planned works is really unfortunate. “I trust that NI Water will work with Council staff in a timely manner throughout the holiday period to have this situation put right and allow sporting fixtures to resume quickly. “This weekend and the holiday period can be quite busy with special football cup rounds taking place and having the pitches out of action is really unfortunate. “I look forward to NI Water’s cooperation and the matter being dealt with swiftly,” added Councillor McGrath.